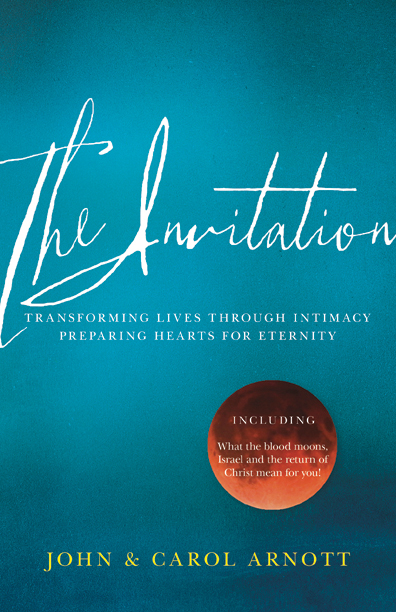 In their latest book, The Invitation, John & Carol Arnott share both biblical and personal revelation of the importance of investing in intimacy with God in preparation for the return of Jesus. As the Bride of Christ, the church is responsible for getting itself ready for the wedding of the Bridegroom. Revival is continually being poured out all around the earth and it is time for us as believers to invest in the intimacy which transforms our lives today and prepares our hearts for eternity. Whether you are a leader, a church member or a new believer, The Invitation will inspire you to to take practical steps today which are fundamental in preparing your heart for the Lord s return. Building a life of intimacy with God will bring transformation into every area of your life. There is no time left to be lukewarm. Transforming lives through intimacy, preparing hearts for eternity. John and Carol Arnott are the Founding Pastors and Presidents of Catch The Fire and oversee the Partners in Harvest network of churches. As international speakers, John and Carol have become known for their ministry on the Father's Love, where they have seen millions of lives touched and changed through encountering the Father's embrace and His incredible love for them.